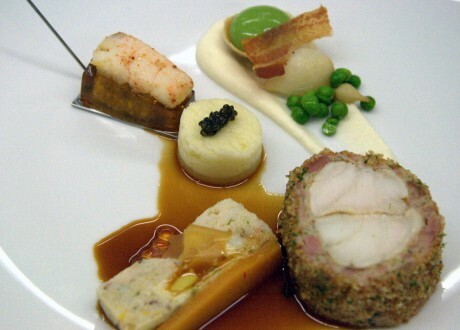 The Bocuse d’Or World Cuisine Contest was created in 1987 by France’s legendary Chef Paul Bocuse. Held every two years in Lyon, France, it’s touted as the world’s most gruelling and prestigious cooking competition, the culinary equivalent of the World Cup. Teams from twenty four countries are selected to compete where each team is composed of one chef and one assistant under the age of 22. A second assistant is be drawn from France’s culinary schools right before the competition, and forms the final member of the three person cooking team. The teams must create two platters, one seafood and one meat, each with three elaborate garnishes and cooked in five and a half hours in front of 1200 screaming fans. The platters are huge and heavy, requiring two people to carry them. The judging panel consists of one chef from each of the competing countries; twelve judges per platter. Each platter contains the 12 portions to be tasted by the judges. Two additional portions are also made: one for presentation and official photography, and another for an honorary judge. The competition has an extremely high profile in Europe, especially France, and they have dominated the winners podium. In the previous dozen Bocuse d’Ors, France has placed in the top three in nine of the competitions, and was the first place winner in six of those. Other countries with historically strong showings are Norway, Belgium, Germany, and Sweden. To date, a North American chef has yet to place higher than 4th place; this was achieved by Canadian Chef Robert Sulatycy in 1999. The Bocuse d’Or is less well known in North America than overseas but that has been changing in recent years. The US has thrown some serious support behind their team by forming the Bocuse d’Or USA foundation, which has renowned chefs Thomas Keller, Daniel Boulud and Jerome Bocuse (Paul Bocuse’s son) sitting on its board. The Canadian equivalent is the Bocuse d’Or Advisory Council of Canada, chaired by Chef Robert Sulatycy and includes many top Canadian chefs such as Robert Clark, David Hawksworth, Thomas Haas, Vikram Vij, Michael Smith, and Mark McEwan. 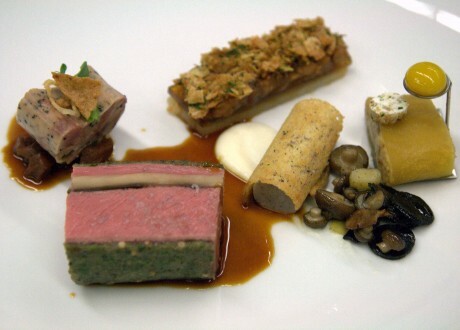 The next Bocuse d’Or 2011 is being held on January 25 & 26, 2011. 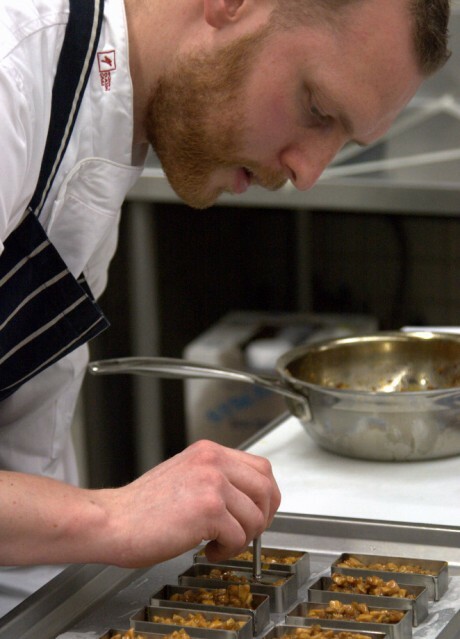 Canada’s representative is Chef Ryan Stone, Executive Chef at the exclusive West Coast Fishing Club on BC’s Haida Gwaii. He’ll be assisted by Talib Hudda. The team coach is Chef Scott Jaeger of the Pear Tree restaurant, who placed 7th for Canada at Bocuse d’Or 2007. Chef Ryan won right to represent Canada at a competition in Montreal in 2008 and has been training for the past 2 years. He was also able to go to France to watch the 2009 competition and experience the ‘crowd conditions’ in person. The West Coast Fishing Club was instrumental in supporting Ryan, allowing him freedom to develop Bocuse dishes and serve them as specials. The Canadian team is also supported by Moxie’s Classic Grill, who has been the title sponsor since 2009. During the competition, each team works separately in their own kitchen area. 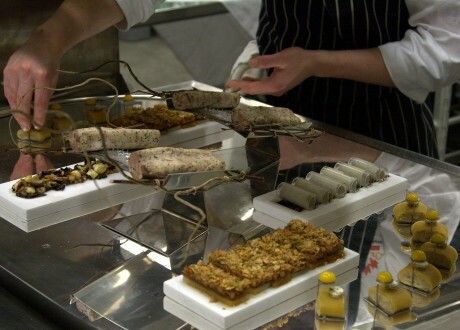 The Bocuse d’Or provides the main protein for the seafood and meat platters but the competing chefs provide all other ingredients. The main seafood and meat changes every time. This year it is monkfish and lamb, both from Scotland. While the majority of the cooking must be done during the allotted five and a half hours, the rules allow for certain components to be prepared ahead of time. The teams must also supply any specialty equipment necessary to execute their dishes. Along with unique molds, serving pieces and cooking implements, the Canadian team is bringing a custom made heating lamp that was specially made for the large serving platters. One of the biggest challenges is keeping the food hot. After the platters are completed, they are paraded in front of the judges and audience, photos are taken, and then the components are plated and served to each judge. Half an hour may have passed from the time the platter is finished to when a judge takes that first bite. 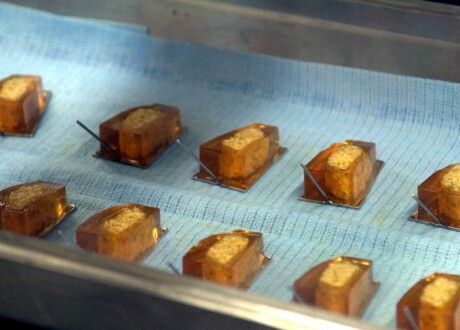 In addition to the heating lamp, several of the components are cooked in custom made glass tubes, and removed from the glass just prior to plating. Glass is an insulating material, and during the tasting it was clear which garnishes had been cooked in glass – they were noticeably warmer than the rest. Chef Ryan and Talib have been training full time and doing timed practice runs for the past four months. On January 5 2010, media were invited to view the final timed trial and taste the finished dishes. The practice run was held at Vancouver Community College; one of their kitchens had been set up and taped off to mimic the dimensions and working size of a Bocuse d’Or kitchen. Chef Tim Bedford, Chef Ryan’s sous chef at the West Coast Fishing Club, provided commentary and answered questions for the media group. He will also be flying to France to assist with ingredient procurement and preparation. The chefs cooked very calmly and methodically with minimal communication between Chef Ryan and Talib; it was clear that they had done this many times before. While the coaches are not allowed to assist with the cooking, a new rule this year allows them to stand on the other side of the kitchen and speak to the chefs. 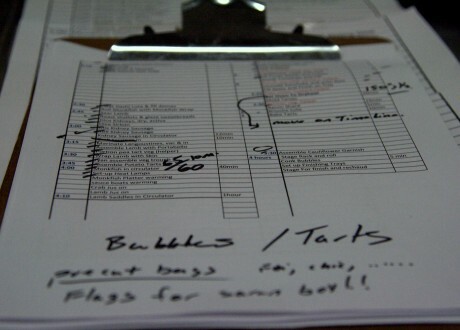 With the cooking prep and task list in front of him, Chef Scott would occasionally prompt the team to ensure that they were on schedule and not missing any crucial steps. The team practices with ingredients that are obtained locally but there can be large differences between what they can get here and the ones they’ll be working with in France. For example, the Scottish lamb that the contestants will be using cannot be obtained in Canada so Chef Ryan flew to Scotland for 4 days to practice with the actual ingredients. He discovered that the loins and saddles of Scottish lambs are significantly shorter than the ones available here, and he was able to account for these differences when practicing at home. The team tried to practice with ingredients as close as possible to those in France. For example, they substituted frozen whole langoustines for whole fresh ones so that the chefs could practice de-shelling. The team will be heading to France several days before the competition, which will allow for further cooking tests prior to the actual event. The judges like to see contestants incorporate ingredients and to take inspiration from their own home country. Birch branches are used to decorate the meat platter. Herb & Mustard Wrapped Lamb, Lamb Steak & Kidney Sausage. Chef Ryan incorporated modern cooking techniques into many of the components, such as sous vide, ‘bubbles’ or liquid ravioli, gels, and meat glues. While the names each of the components seem simple and concise, they each represent many labourous hours of work and all have multiple sub-recipes. Langoustine & Tomato Gel in custom made serving pieces. Sunchoke & Truffle 'Marrow' custard in their glass tubes. Golden Beet with Eggplant & Pine Nuts in custom made serving pieces. Kulen is a spicy chorizo-like pork sausage that originated in Serbia and Croatia. The sausage mixture is custom made for the Bocuse team by D-Original Sausage on Main St. The liquid for the dashi layer has been set into a solid ‘hot gel’. The langoustines were vacuum sealed in a custom mold, then poached sous vide. 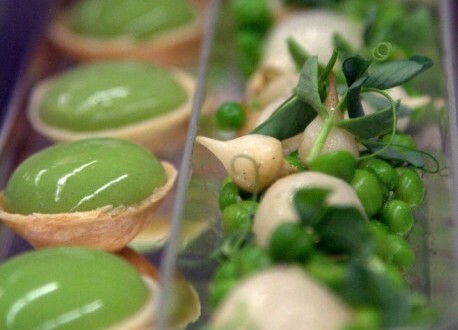 A pate brisee tart shell holds a pea ‘bubble’. This is a modern cooking technique whereby a liquid mixture is formed into sphere using calcium chloride and sodium alginate. When the bubble is eaten, it bursts inside your mouth. The cauliflower mouse is a savoury Bavarian cream that was molded and cooked in a custom glass tube. The green herb wrap made with pork skin that had been rendered 5 times, then diced. Other ingredients were yellow & brown mustard, rosemary, parsley. 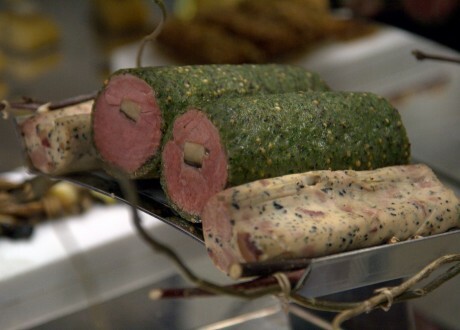 In addition to being encased in a herb wrap, transglutimase (aka ‘meat glue’) was used to bind the lamb meat to itself. Lamb fat was used to cook the portabello mushroom in the middle of the roll. The sausage mixture was shaped into a log in plastic wrap, then wrapped around a long metal tube & poached sous-vide to make a kidney shaped sausage. The kidneys were cooked inside a vacuum chamber. The sweet breads were poached and cooked sous-vide in milk. The tart was topped w/ crispy chicken skin. The potato was confit in duck fat with herbs & spices. An onion soup hot gelee was made with caramelized onions, lamb & veal stock, and sherry, then set with gellen. 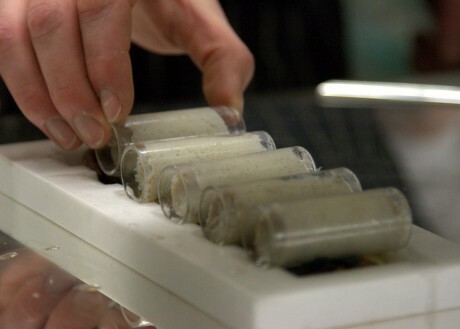 A sunchoke and truffle custard mixture was cooked in glass cylinders in water bath. 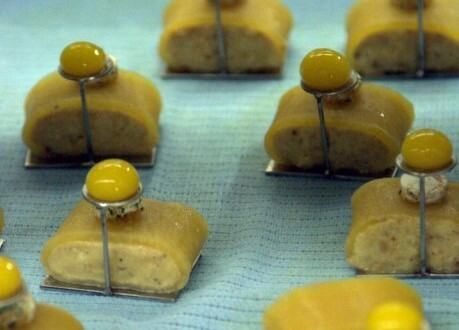 They were left inside the tube until just before serving to keep warm. The tiny round beet bubble was made using the same technique as the pea bubble. * Photos courtesy of Cliff Hammerschmidt. I’d how loved to sample this! Thanks for the detailed coverage Brenda. Good luck to Chef Ryan and his team. If possible, please tell Ryan good luck, and that he is going to do awesome from Joerg – a friend of the WCFC and big fan of his. Recent article with recipe was in our local newspaper, always wanting to try new ways to enjoy atlantic salmon i prepared Chef Stone’s salmon special with the brioche topping, NOT so special , very disappointing.